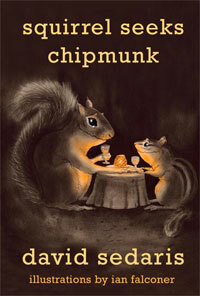 Squirrel Seeks Chipmunk: A Modest Bestiary features David Sedaris‘s unique blend of hilarity and heart, this new collection of keen-eyed animal-themed tales is an utter delight. Though the characters may not be human, the situations in these stories bear an uncanny resemblance to the insanity of everyday life. David Sedaris is one of my faves ever since I listened to the audiobook Me Talk Pretty One Day.